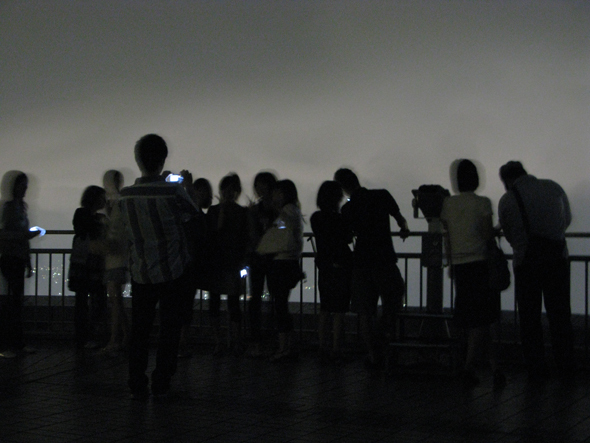 Nagasaki’s 10 million dollar night view…the last view you’ll see as a couple? 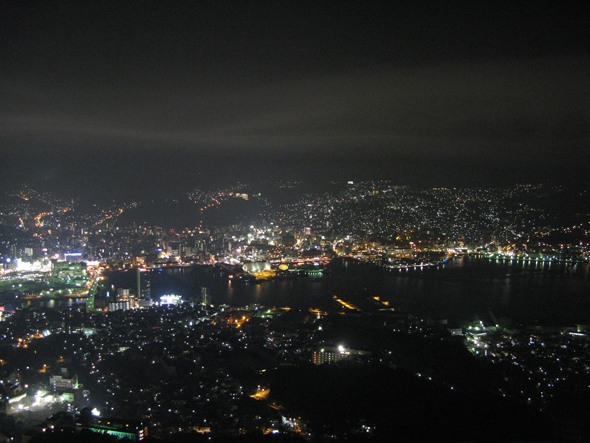 If you ever find yourself in Nagasaki, Japan and you are stuck for something to do after the sun goes down – take the cable car up Mount Inasa and you can take in Nagasaki’s “10 Million Dollar Night View”! Now I must admit I didn’t realise this was a “10 million dollar…” view when I went up the hill that evening. I only realised this whilst searching online for the name of the hill. As night views of cities go, this is a pretty nice one… the photograph doesn’t do it justice (no tripod). Well, I also read on a couple of websites that “This is also a common place for young local couples to break off relationships…” – notice ‘break off‘!? So now I look back at the photograph below I’m wondering – are the couple centre-right having a romantic evening or ending their relationship??? One thing that has crossed my mind though is this – if this is true, surely you would never go up there – as soon as your girlfriend says “shall we go up Mount Inasa tonight?” you’d know that it was all over, right? Help – anyone out there now if this fact about Mount Inasa is true? Help raise money for the survivors of the Japan Earthquake and Tsunami via Todd Wassel‘s “Blog for Japan” campaign. Todd’s idea is simple, if you have a blog, newspaper, or other way of publishing information and are willing to support the Japanese Survivors he would like people to reproduce and promote his article on How to Help Japan’s Earthquake and Tsunami Survivors. Hi Andrew. Glad you liked it – I like to be different! I wonder way people would take that long ride up jsut to break off their relationship. Nice photos of the city and the one of the people. I love the shot of the people. A different subject than most shoot when they visit such a nightview.